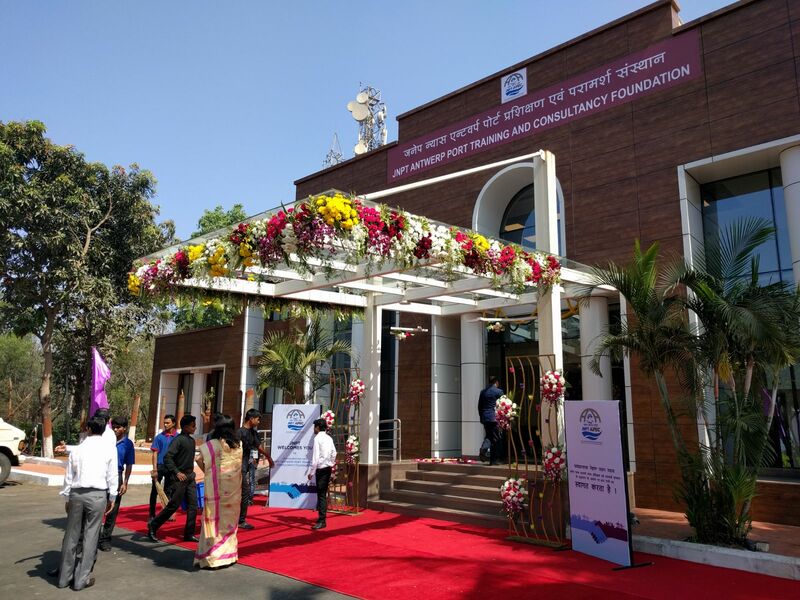 Indian port professionals who follow courses given in Mumbai by APEC, the port of Antwerp training centre, can now benefit from a purpose-built training facility. The new facility was officially opened on Monday this week during the annual Port of Antwerp Mission to India, in the presence of Belgian deputy prime minister Alexander De Croo, port alderman Marc Van Peel, APEC principal Kristof Waterschoot, JNPT chairman Shri Neeraj Bansal and Indian Port Association chairman Shri Sanjay Bhatia. After the inauguration the guests attended a first lesson in the new training centre. Port professionals in India have been able to follow APEC courses since 2015 when the Antwerp training institute signed a five-year agreement with the Jawaharlal Nehru Port Trust (JNPT), the largest container port in India. At that time JNPT planned to expand rapidly in terms of container handling, and to help it achieve this ambition it turned to APEC which already has nearly 40 years of experience in training port professionals, both white and blue collar. The fact that Antwerp is an important trading partner of India made the choice of APEC even more obvious. A tailor-made series of courses was developed, covering among other things port management, infrastructure development, maintenance and security. Initially the courses were held in temporary accommodation, but now that has changed. The JNPT – APEC Port Training & Consultancy Foundation is now the main base for Indian port professionals wishing to acquire know-how from Antwerp. The official opening was held during the annual trade mission to India by the port of Antwerp. The programme traditionally includes an Antwerp Port Day reception at which many contacts in the maritime and other sectors are invited. The guest of honour this year was Eddy Bruyninckx, who was lauded for his long and influential career as CEO of Antwerp Port Authority, a position from which he finally retired at the end of last year. The port of Antwerp has for many years now invested in close collaboration with the Indian business world and local authorities. With success: the annual volume of trade between India and Antwerp has grown to more than 6 million tonnes as of last year. In 2012 the port of Antwerp went a step further in reinforcing its position in India when Port of Antwerp International (PAI), its international consulting and investment subsidiary, entered a strategic alliance with Essar Ports Limited, one of the largest private port operators in India. The alliance was formally wound up in mid-2015, by which time the Port Authority had not only realised a capital gain but also obtained crucial commercial insights into the Indian port world. This in turn led to further agreements both for PAI and for APEC. Today Deputy Prime Minister Alexander De Croo launched the Antwerp Port Days in the Port of Mumbai.